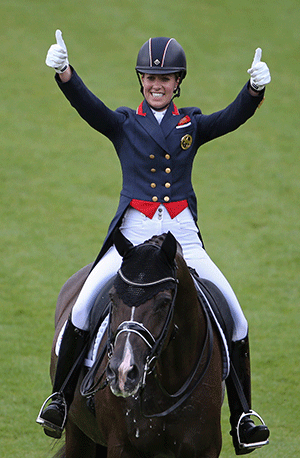 Charlotte Dujardin is an elite British dressage rider, winner of three Olympic gold medals and a silver (London 2012 and Rio de Janeiro 2016), European Champion, and World Champion, and holds all three World Records in the sport of dressage. Born in Enfield, England, Dujardin was brought up in Hertfordshire and started riding when she was two. By the age of 16 she had won the Horse of the Year Show competition four times, and her trainer at the time encouraged her to explore the sport of dressage. In February 2007, Dujardin had some lessons with British Olympian Carl Hester, and spotting her talent, he offered her a job as a groom. She was asked to bring along a young Dutch Warmblood gelding named Valegro with the intention that horse would eventually be ridden by Hester; however, after Hester and his co–owner awarded the ride on Valegro to Dujardin when their partnership and great potential became apparent, and so began the pair’s meteoric rise. Along with her many medals and awards in the dressage arena, Dujardin was named BT Action Woman of the Year (2014), Sunday Times and Sky Sports Sportswoman of the Year (2014), and Commander of the Order of the British Empire (2017). Dujardin remains based at Hester’s barn in Gloucestershire, England (www.charlottedujardin.co.uk). Photo by dpa picture alliance / Alamy Stock Photo used by permission.